WHY WAIT TO BUILD? Are you looking for a BETTER THAN NEW IMMACULATE MOVE-IN READY home with 3 bedrooms, a great room plan with a FENCED IN BACK YARD on a BEAUTIFUL CORNER LOT? Look no further! This 2012 built home features a BEAUTIFUL ESPRESSO SOLID WOOD CABINET kitchen with GRANITE COUNTER TOPS, STAINLESS STEEL APPLIANCES (including a brand new refrigerator), CERAMIC TILE BACKSPLASH and CENTER ISLAND WITH BREAKFAST BAR. Upon entering, you are warmly greeted by an OVERSIZED ceramic tiled FOYER with a TRAY CEILING and CROWN MOLDINGS. You’ll enjoy the OPENNESS of the combined kitchen, family room with BEAUTIFUL ENGINEERED WOOD FLOORS and breakfast nook with sliders to the lanai for entertaining or just so that everyone’s CLOSE BY AND CONNECTED while preparing meals, dining, watching tv or just hanging out. You’ll love the master suite with CROWN MOLDINGS, master bath with DUAL VANITY MARBLE SINKS, GARDEN TUB, SEPARATE SHOWER and LARGE WALK IN CLOSET. The home has a SPLIT BEDROOM PLAN with the secondary bedrooms sharing a full bath. You can relax on the STRUCTURALLY COVERED LANAI enclosed by a large fenced and MANICURED BACKYARD. A great spot to ENTERTAIN WITH FRIENDS/FAMILY and allow the kids and pets to move about freely. The home is TASTEFULLY DECORATED and the paint colors are perfect! 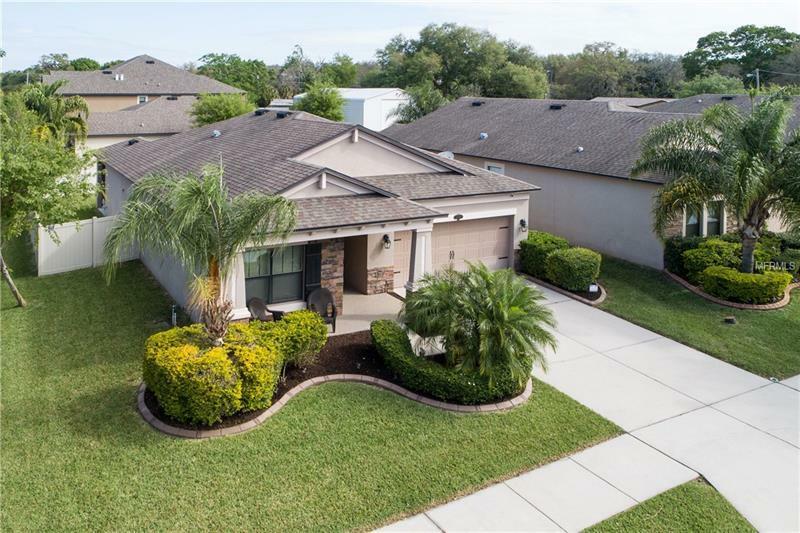 Other features include: STONE FRONT; CROWN MOLDING throughout most of the home, LAUNDRY ROOM PRE-PLUMBED FOR WASH TUB, PAINTED GARAGE FLOOR, WATER SOFTENER, HURRICANE SHUTTERS, NO CDD FEE, LOW HOA FEE AND MORE!